Dr. Ram Manohar Lohia Institute of Medical Sciences (RMLIMS), Vibhuti Khand, Gomti nagar, Lucknow – 226010 has posted an advertisement for recruitment of doctors for the posts of Senior Residents in various departments. 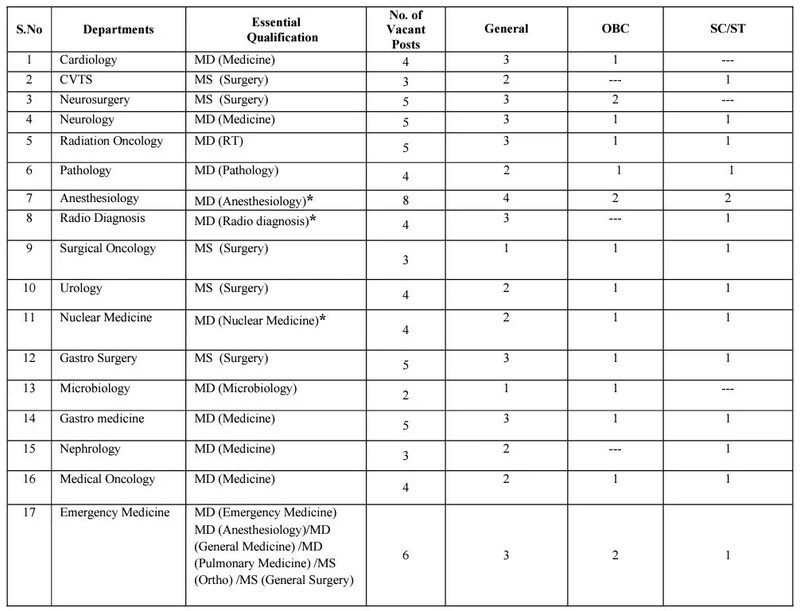 Posts: Total of 74 posts are vacant in vaious departments like Cardiology, CVTS, Neurosurgery, Neurology, Radiation Oncology, pathology, Anaesthesiology, Radiodiagnosis, Surgical Oncology, Urology, Nuclear medicine, Gastro Surgery, Microbiology, gastro medicine, nephrology, medical Oncology and Emergency medicine departments. Salary: Pay scale o Rs. 15,000-39,100 (grade pay Rs. 600). Essential Qualifications: MD/ MS in respective desciplines is required. Candidates having DNB degree may also apply. candidates with diploma with 3 years of work experience will be considered if degree candidates are not available. Important Dates: Last date for receipt of application is 07-06-2014 till 05:00 pm. List of eligible candidates will be uploaded on 10.06.2014. Interview of eligible candidates will be held on 21/06/2014 from 10:00 am onwards in Administrative Block of Dr. Ram Manohar Lohia Institute of Medical Sciences. Age Limit: For general candidates age limit of 40 years till date of publication of advertisement. Age relaxation for SC/ST/OBC candidates is as per Govt. of India rules. Application Fees: Application fee (non-refundable) of Rs. 200/- which has to be submitted as DD in favor of “Director, Dr. RMLIMS, Lucknow”, payable at Lucknow.